Traffic control doesn’t begin on the roadway; it begins long in advance with effective traffic plans and the securing of all necessary permits. Given the importance of these preliminary steps, Roadway Construction Service (RCS) focuses considerable attention on traffic control planning, city permitting, and service. The core of these services is our road traffic control strategists. They shoulder the responsibility for handling all preliminary aspects of lane closure planning and city permitting. The selection of traffic barriers is one of these aspects. If the latter is the case, water-filled plastic Jersey barriers (a.k.a. k-rail rental) are the right choice. Being durable yet highly mobile, they can be set up quickly — and with minimum hassle. In contrast, concrete Jersey barriers are heavier and more suitable for long-term projects. Because work conditions can vary tremendously, our team goes to great lengths to choose the proper type k temporary railing. As with our other traffic control service, identifying the optimum solution is the hallmark of our k-rail barrier rental. Traffic control planning requires equal attention directed at the traffic controller. For every work project, a diversity of personnel must be selected, organized, and deployed. Traffic flaggers are among this group. Before these important personnel are selected, traffic control strategists analyze a work site. Conditions, dimensions, expected traffic flow, and other variables are compiled into an overview of the location. Based on the overview, planners select the number and positioning of traffic flaggers to maximize safety and efficiency. Traffic control planning also must address the traffic control permitting process. For this crucial phase, only informed, detail-oriented minds will suffice. Permitting requires in-depth knowledge of municipal codes, rules, and regulations. Fortunately, this is familiar territory to our planners. Moreover, through years of experience, our team knows many of the key municipal decision makers. These long-standing relationships facilitate smooth communications and timely decisions. You might say we have a fast pass for answers. Roadway Construction Service believes that careful, air-tight planning is needed for everything from k-rail barrier service to the deployment of traffic flaggers. Because we leave nothing to chance, glitches are a rarity. And that means smoother, safer roads for clients, workers, drivers, and pedestrians. Do you need reliable traffic control services precision-planned to the minutest detail? 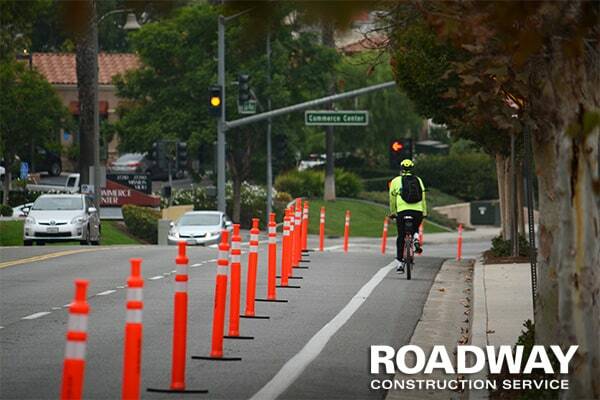 Count on Roadway Construction Service for the best in traffic control planning, city permitting, and service. To learn more, contact Roadway Construction Service for additional information about our industry-leading solutions and very competitive rates.